So today was kind of weird. Made it through work fine, but by the end I was getting very antsy. Couldn’t even decide what to do on dinner, went back and forth trying different ideas, eventually went to meet my mom at her house and we went out for dinner together. It was a nice way to pass the evening and catch up and I really enjoyed it. I ranted and raved about things in my head for a little bit but quickly got over it. After dinner still couldn’t really decide what to do, even though mom suggested walking around downtown which I said no to do to the weather, or even stopping at a shop on the way back, which I also said no to with the idea that I needed to get back and start cleaning my house. I ended up going and getting a tattoo that I’ve wanted for years instead. Waited and waited and waited patiently, I just couldn’t take it anymore and had to have it now – right now. I called the shop I usually go to and they didn’t have anything until next week so I went to the little place at the mall to see if they had any openings and they were able to squeeze me in at the end of the night. I felt amazing. It’s so strange. I was totally and completely relaxed, no muscle tension at all, no wincing against the pain, just listening along to the music, and completely calm for the first time in weeks. Months, even…just totally chill. l asked the guy if there was scientific reason that you felt like that, he replied with something about neurotransmitters and adrenaline. I think there was something even more… can’t put my finger to it though. I mean seriously – I could feel my heart rate slowing and my blood pressure leveling the second the needle touched my skin – what’s up with that? Kinda fucked over my weekend cleaning plans since I now have to be super protective of my hand, but I barely care given this magical state of mind I’m in. 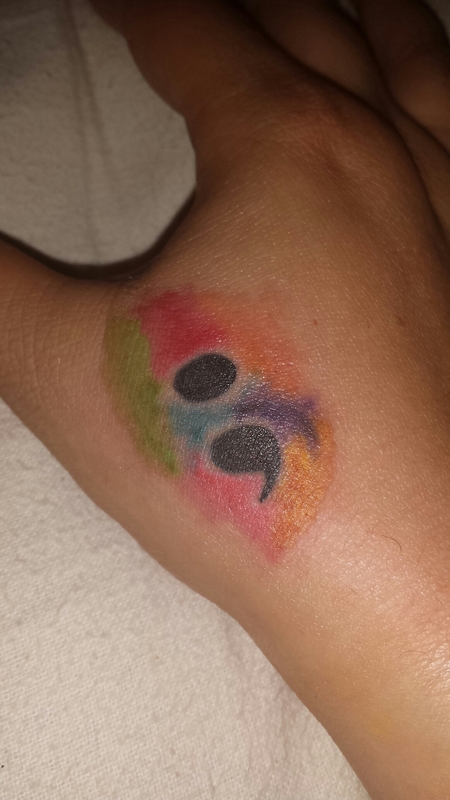 The semicolon represents the option an author had to end a sentence, but chose to continue. Your life is the sentence and you are the author. I seriously can’t get over how relaxed I am. Although it’s also midnight and I’m nowhere near sleep. Whatever, I’ll deal with tomorrow tomorrow. Plus, Autumn is allegedly coming. Love the meaning of your tattoo. I got my first (and only one!) back in December and it also relates to life and means a lot to me. Even though I was in dissociation and never thought I would get a tattoo! I designed it myself, it’s simple but meaningful like I say. I hope it reminds you of life like that too. It’s really quite a similar idea to mine. To do with life and death and where there is life there is love and passion and hope. And death is the end. Anyway, don’t get me talking about all of that!! I also was relaxed when having my tattoo lol. The tattooist was like ‘are you OK?’ And I’m like ‘yup!’ And my eyes were closing I was so relaxed! Definitely something chemically going on in the brain right there!!! I still only have the ONE tattoo, as you know from the experience of guiding me through that first experience. Most definately something chemical in all experiences… *smiling* Big Hugs and much love as always.